Mike called WIRES when he realised a large Coastal Carpet Python snake was still in the same position as it had been 3 days earlier. The snake is now in care as it has an injury possibly caused by a vehicle, it will be released back to it's home territory at Rosebank as soon as it has fully recovered. My husband and I joined WIRES, Northern Rivers earl August 3, 2015 cellent. 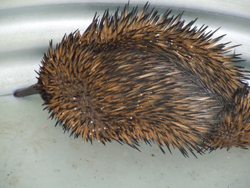 I have done some shifts on the 24 hour Hotline and 3 weeks ago our first echidna, Mr Big , came into our care, as a result of a being hit by a car. He resides in a 3 meter pen under the house, as that's the coolest spot and it's covered in mosquito net to keep away the flies. As he has a broken snout, we are unable to place any soil or hard objects in the pen, so we place lots of shredded newspaper in there for him to burrow under. Vets will x-ray his snout again this week, if all is well we hope to release him at the end of the month. 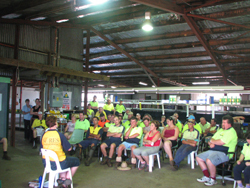 In the lead up to taking an animal into care we have been provided with lots of support and information by the Echidna Coordinator Sharon. Indeed we have been provided with lots of support and information since becoming WIRES members with plenty of training available. We have found WIRES to be a very professional organisation managed by an incredible team of people and we feel proud to be part of it all. Lismore firefighters were called to rescue a little black duck that had fallen down a storm water drain in Leycester Street last week. Firefighter Andrew Hunter said they got the call from a member of WIRES last Tuesday. 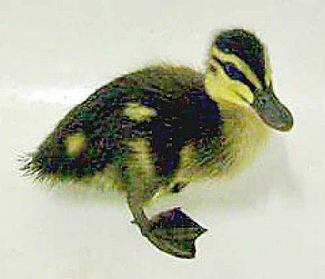 The pacific black duckling had slipped through the cracks of a grate and fallen about five metres. “I don’t know if I’d call him the duck whisperer, but he does have a love of birds,” Mr Hunter said. He said it wasn’t unusual for the firies to get called out for an animal rescue, but two trucks with eight permanent and retained firefighters all went out to the job to make sure the duck came out alive. For Aiden at Evans Head. 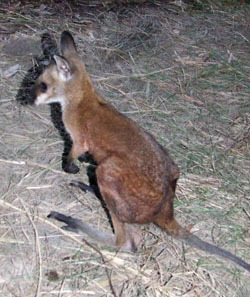 WIRES received a call from Aiden of Evans Head in September regarding a small Red-Neck joey he had found in her dead mothers pouch. 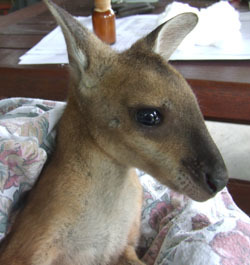 The little joey is seen here 8 weeks after arrival with WIRES. 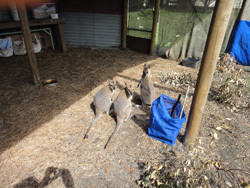 She is in the company of 7 other joey's, interacting well, and growing steadily. She will be released with her new family in about 4 months time. Thank you Aiden for calling WIRES. Peter of Corndale called the WIRES hotline when he was concerned to find a flying-fox entangled on a barbed- wire fence on his property. Matt, one of our rescuers, went to the rescue on the way to his night shift work. The injuries from the barbed wire entanglement were horrific; there were exposed bones and most of the membrane on one wing was gone. It was late in the day and this grey-headed flying-fox must have been there for more than 12 hours. She would have been in considerable pain and it was clear that euthanasia was her prognosis. After a rough week for our bat carers with more bat lives lost from barbed wire & netting injuries than lives saved, it was depressing to be facing yet another euthanasia. But wait! This flying-fox was heavily pregnant. 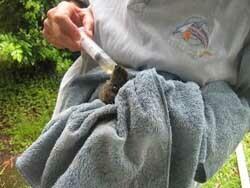 I called the wildlife friendly vet practice at Lismore Central Veterinary Hospital. They were willing to try a caesarian. They sedated the injured female with gas and a 62 gr female baby was successfully brought into the world. 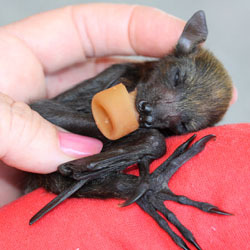 Her severely injured Mum was sent to bat heaven. The little pup opened her eyes wide soon after delivery and started breathing easily after all the birth fluids were removed from her face, mouth & nostrils. High fives & happy snaps all round. The pup is named Jemma (after the vet) and is doing well in care. Hooray and thanks to Lismore Central Vet Hospital staff who stayed back into the evening hours to carry out this life saving operation! Dogs and wildlife do not mix. This little Pademelon joey lost her mum due to a domestic dog chasing mum through the bush and although mum was not caught by the dog she dropped her little joey in the chase. The dog's owner saw the joey drop and gently picked it up and called WIRES. Reuniting a joey and it's mum in situations like these is impossible as we would have to leave the joey in order for mum to come back for it. 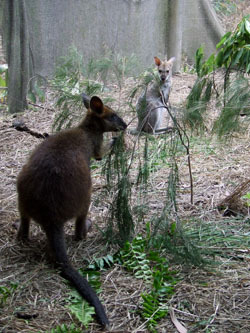 Mum will not return for extended time due to stress and fear, myopathy is also a high probability and as you can see in the picture the joey is too small to be left alone in the bush. 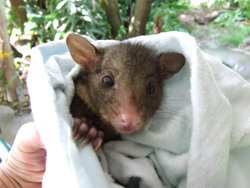 The little female Pademelon joey is now in a humidicrib still not able to regulate her own body temperature, she is being fed 4 hourly around the clock on special wallaby formula and will spend the next 6 months in care before being release back to the wild with others of her kind in care. Fire Season is not a good time of the year for many of Australia's' native Wildlife. Hazard reduction burns and people burning off also contributes to the number of animals WIRES sees coming into care due to burns & habitat loss. 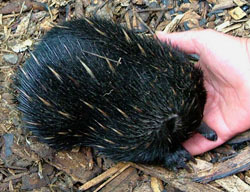 Echidnas are one of those animals that just cannot out run a fire. They have developed a method known as 'burrowing in', if a fire threatens. However, this doesn't always work for many varied reasons eg soil too hard or when they are carrying their young. 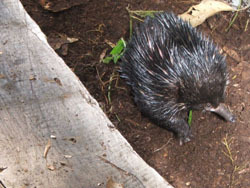 People or predators such as dogs, standing around watching a burn off will also deter Echidnas from entering open ground away from a fire, if they are unable to burrow in. 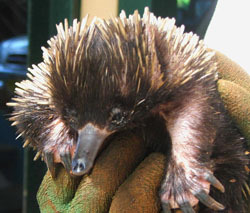 Little Bernard, a young dispersing Echidna, was caught in a burn off and took the option of burrowing in. Unfortunately he was not able to completely protect his entire body and his back was left exposed to the flames. Wandering amongst hot coals & logs is when he sustained further burns to all four of his paws. Bernard was found much later wandering through the burnt out vegetation that was once his home range habitat. WIRES carer, Vince, was called into rescue & care for this poor little fella. He had survived his burns but was unable to dig for his favorite food, the termite. He was also unable to dig a burrow to hide in and had lost a lot of weight. The spines on his back were all burnt and broken off and he was now vulnerable and totally defenseless against predators and dog attack. Bernard's skin on his paws and back have now healed completely and he is doing well in care. He enjoys his specially prepared meals and has doubled in weight. However before he can be released, new spines will need to re grow around the base of each old spine. This may take some time. Heavy rain during the night of 3rd October saw the WIRES Rescue Hotline overwhelmed with calls the following morning. At 8.30 rescuer Shaz McGrigor was sent off to pick up a small unidentified creature that resembled a very wet rat. It was found by Alice, in the middle of the driveway, upside down & still breathing. Alice wrapped it up and put it in front of the heater, until help arrived. 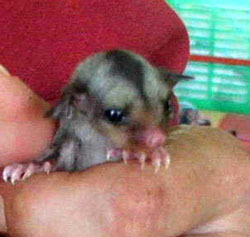 When we all sat down to see what it was, we found it was a tiny 15g Sugar Glider joey. Soaked to the bone & still very cold, we immediately towel dried this tiny joey and warmed him up, by placing him on a wrapped up water hot bottle. 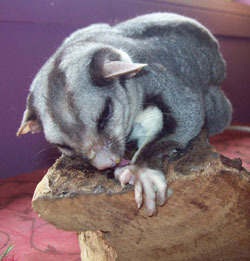 This beautiful little Glider is now in care with Wires carer Cath, who has another 2 gliders of a similar age and size. They will now be reared together as a little family. Thanks to Alice for caring enough to pick up this little Glider & ring WIRES for help. The gliders were transferred to WIRES carer Julia's large glider aviary some time ago in order for them to test their skills in the art of gliding, build muscle and strength before being released back to the wild on 20 December 2010. 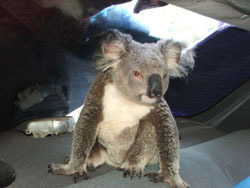 This Koala was called into the WIRES hotline after a member of the public came out to see what all the noise was about. He had heard two male koalas having a bit of a fight, but upon investigating further, he came upon another. To Peters surprise, he discovered this female sitting in the back of his car trying to escape the dueling males outside. Yes Peter had left the car door open, as he was cleaning it out. He did not expect to find a Koala on his return. After an unsuccessful attempt at persuading her to leave. Peter soon learnt she was not to be tangled with. She let him know she was not going anywhere, by giving Peter 2 full swipes, with claws extended. Not so good for Peter whose face just happened to be the closest to Mrs Koala. Time to ring WIRES to help get this big girl out of the car. We soon released she was defending herself as she was carrying a tiny pink joey in her pouch. 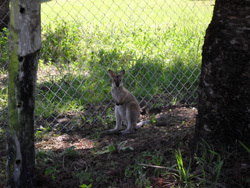 Driving home from work Ollie from Jiggi saw something unusual on the side of the road, he stopped and what he had seen was this little Red-Necked wallaby joey sitting all alone with no mum to be found. Ollie was aware that such a tiny joey should not be sitting on the side of a busy road all alone, so he picked it up, wrapped it up securely and when he got home called WIRES. The joey is settling in well, and will shortly be introduced to other joey's in care. Joey is now in an outside enclosure spending most of his time in his artificial pouch, coming out for short hops around the pen and then back in his pouch. He will be in care for approximately 7 months and then released back to the wild. Last week some friends called in with a tiny Sugar Glider joey that they had found in the middle of the road, in Dorroughby. Celine & Didea were taking their Family, who were visiting from France, on a sightseeing tour of the area, when they saw something on the middle of the road. Unsure what it was they turned the car around and went back to check. To their surprise it was a tiny grey ball of fluff. A baby of some description, all alone with no sign of Mum. Celine picked it up carefully and wrapped it in a jumper, then they headed off to their WIRES friends Shaz & Eric at Rosebank. 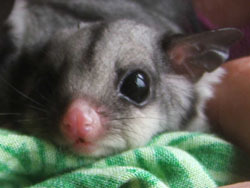 What they had found was a tiny 30g Sugar Glider. She was badly dehydrated but was nicely warmed up, thanks to Celine. No injuries but obviously, frightened and in need of re hydrating. 5 days later this little critter is doing just fine and has settled into her new home & 4hrly feeding regime. She has put on weight, now 42g, and will be reared until her release weight is achieved. 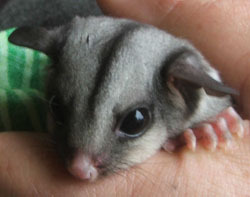 Thanks to Celine & Didea this adorable female Sugar Glider will have a second chance-We called her Celine. 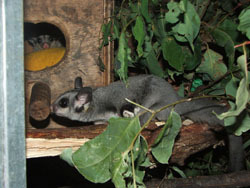 The two gliders in previous and above story have now been united with a third glider in care, they are seen here having a snuggle. 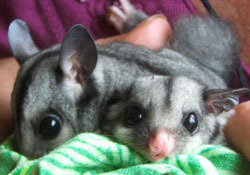 Gliders thrive in each others company which is why we unite similar size joey's when in care, they are social animals and need each others company. WIRES Hotline received a call from Darylee at Rosebank about a tiny baby glider that the dog had brought in. They had wrapped it up and placed it in a makeshift pouch. A hot water bottle wrapped in a towel was provided for extra warmth. All instructions they were given by the rescue hotline. They did a great job & this is exactly what this tiny 80g Sugar Glider needed until a rescuer could pick him up. The Family was very excited about the Glider, but disappointed that an injury had occurred. 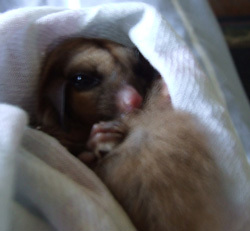 This little Glider would have just emerged from its nest and may have been on an exploration journey with Mum. 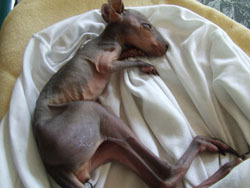 This joey required antibiotics to overcome his injury and some time in intensive care. He is now doing well and loves being fed on bottlebrush flowers. He is almost ready to be transferred to a large outdoor enclosure and will be released back into the wild when he has learnt the art of gliding. 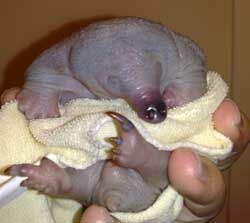 These tiny Echidna Puggle's are currently in care with WIRES carer Sherryn. 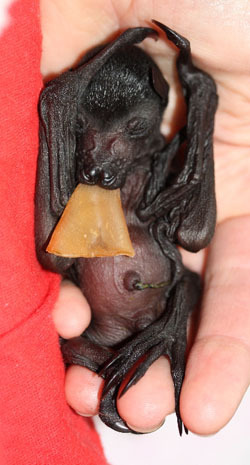 The first orphan flying-fox of the season came into care on September 19th, which is quite early. Melody (named after the daughter of her rescuer) is just 63 gr and is premature. 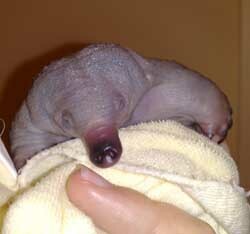 Her umbilical cord was still attached. Melody is a black flying-fox (pteropus alecto). Melody sleeps all the time, waking only for a feed every few hours. She will be in care for at least four months until she is big enough to be released with other orphaned flying-foxes we raise during the 2010 season. If Melody was still with her mum she would be attached to the teat, this is why she has been given a dummy. This little fellow is just 280gram, he is a Mountain Brushtail possum and he was found in his dead mothers pouch at Ewingsdale near Byron Bay. How mum died is a mystery as there were no visible injuries. Although this region is rich in diversity of colour of Mountain Brushtail's he is certainly unusual as he is the first totally golden one we have seen. His mother was golden below and light grey above. 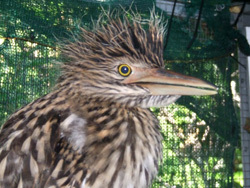 He will stay in care for approximately 8 months and then be released back to the wild. WIRES would like to thank Rebecca & Robert for stopping and staying with the injured animal when Rebecca accidentally hit a kangaroo on the road at Casino. I was on my way to work when the mother kangaroo hopped in front of my car, causing me to hit it. I stopped straight away to see if it was ok, and found the joey on the ground, so I raced to my car to get a blanket, but by the time I got it two people had stopped to help me, one of them Robert, If it wasn't for him I wouldn't have been able to contact you guys, but now I have your number for next time. I cradled to joey close to me and held it in the blanket and in my jacket so it would get my body heat. I got all gooey eyed when I was holding her, she was such a cutie!! Unfortunately the adult female Eastern Grey kangaroo was severely injured. We would like to thank Lachlan who is registered with WIRES as a licensed shooter for ending the adult kangaroo's suffering in such a professional way. For members of the public to stay with an injured animal until WIRES can get to the site is of great help. Trying to locate an injured animal can be extremely difficult as often the animal will try to hide, suffering for an extended time while severely injured. In this case the kangaroo had managed to struggle into a paddock which would have made her extremely difficult to locate had Robert not stayed with her. A young joey such as this needs urgent attention especially if it is thrown out of mum’s pouch, as it will become cold in a very short time. 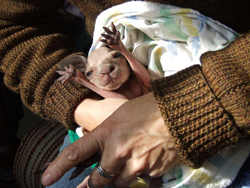 Rebecca made sure this would not be the case for this little one; her actions saved the joey’s life. 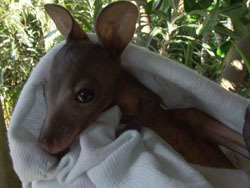 This little joey is now in care with Bess, a trained WIRES macropod carer. The joey is not yet old enough to keep her own body temperature so she is in a humidicrib and is being fed 4 hourly around the clock. She will stay in WIRES care for the next 12 months and will then be released back to the wild. 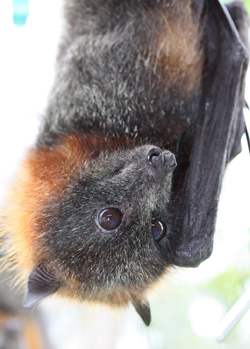 Candy, a Grey-headed flying-fox was caught on a barbed wire fence in South Lismore. 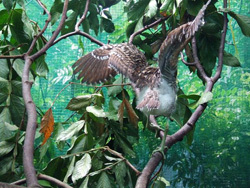 Amazingly, there was little damage to her wing membrane, however she had bitten onto the barbs which punctured her lower jaw in several places. She’d also lost a few teeth in the process. Candy was taken to Goonellabah vet, James Clarke-Williams for assessment. Candy was prescribed antibiotics and medication for pain relief. Grey-headed flying-foxes are listed as vulnerable to extinction on the endangered species list, so every one which can be saved is important. Flying-foxes are intelligent animals and Candy was very accepting of her rehabilitation. Candy had to have a special diet because of her mouth injury. She had to be medicated and have her injuries checked and treated twice daily. After a month in care with WIRES bat carer Lib Ruytenberg, Candy was returned to the wild. 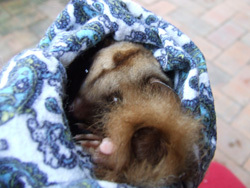 A female Common Brushtail who had been clipped by a car was dropped off at the Casino Vet Clinic. Travelers picked her up and the only info they gave was were they found her, on the hill (mountain!) this side of Tabulam. Luckily the possum was only missing some skin on her chin and was a bit concussed. After a week in care she was ready for release. Possum coordinator said to return her in the possum box as we didn't have an exact location, so yesterday Shaun and I made the trip out there, and had a good look around for a suitable release site. We took a dirt side road off the highway and set off on foot to find a suitable forked tree (amazing how hard this can be!) We returned to the car eventually to find a paddy wagon and a very suspicious police officer. After some fast talking and showing my WIRES ID card he sped off to follow another car. We found out later they were searching for the robbers of the Casino News agency. So back into the bush we traipsed with the possum in her box and the ladder. After struggling with me on the ladder with the possum box balanced on my head and Shaun up the tree, we realised it just was too high to get up there and had to find another tree. Finally we had the box firmly attached. We went back to the car and picked up my camera, when Shaun realised he just had locked the car keys inside! At this stage all we could do was laugh. So I set off for the photo shoot while Shaun amazingly found a piece of wire and broke into the car. After 3 hours and over 100 km round trip we made it home just on dark. Ah, the things we do! Thank you Greg for calling in Mum and joey Swamp wallaby. Mum did unfortunately not survive, her joey had a broken toe which has been splinted at Lismore Vet clinic and we hope for her to be released back to the wild in about 8 months time when she is old enough to fend for herself. A large female Mountain Brushtail possum came in to care on Sunday night. 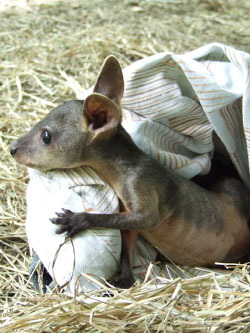 She was breathing but unconscious her breathing was labored and very loud, she also had a pink joey in the pouch. No injuries other than some blood on face has had a terrible hit to the head. I took her to Vet on Monday and she said it was a massive concussion her eyes were not reacting she did not attempt to move. The vet said to give her 48 hours to see if the swelling on her brain would go down. She must have had a very bad head ache. Poor love I felt so sorry for her. She allowed me to lift her head up and prop her up and use a tube to give her lectade Her eyes opened yesterday and were reacting. I made up a puree of gum leaves, apple, banana, it looked disgusting but when I put the tube in her mouth her little tongue lapped it up whilst I held her head in my hand.What a trusting gentle giant. I needed to get fluids and some sort of food into her so her could feed the joey. I nearly cried tonight after three days of feeding her like this hoping she would come good she got up tonight and stood.I put a gravillia flower in the cage with her and she started having a munch.I had a bit more of the puree left so opened up the cage put my hand in and she grabbed the syringe as I put it in her mouth and started lapping before I even pressed the plunger. Even though she was basically out to it she knew what was going to come out of it and must have liked it. She is going over to a large aviary so we can make sure she can climb etc will keep her in the aviary until we can see she is eating climbing and there is no problems before releasing her. I would not have believed she could have come good after what she was like on Sunday. 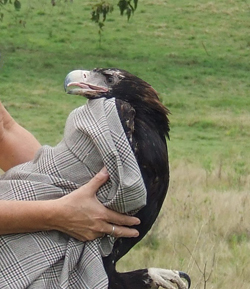 Thank you Ken for bringing this beautiful Wedge-tailed eagle to WIRES attention, she was undernourished and unable to fly. After days of tender loving care by WIRES raptor coordinator Melanie she was successfully released back where she was found. Melanie said " As you can see I had my heart in my mouth as to whether she could fly well enough, but she was wonderful "
WIRES received a call early in the morning on 1st March that a wallaby had been hit by a car at Wadeville, the wallaby was injured but had disappeared in to thick scrub. It was also mentioned that the wallaby was a female with a joey in the pouch. WIRES rescuer Jen and Macropod carer Tina went out to the scene of the accident but was unable to locate the wallaby or her joey. 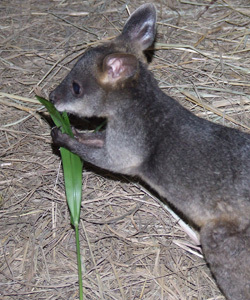 On the evening of the 5th March WIRES received another call from Marshall who had seen a small joey on the side of the road as they drove past. Jen once again went to the rescue and realised this was the exact same spot where the injured mother was last seen. 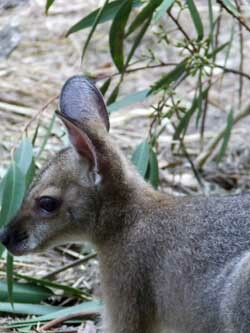 The little male Red-Neck wallaby joey was brought to Tina weighing just 790 gm. He was severely dehydrated and his feet were swollen and bleeding. At this stage of development he would not yet be out of the pouch let alone stand and hop. He was given intensive care eg. rehydrated, three hourly bottles and treatment for possible Myopathy. Marshall as he has been named is seen here 5 weeks after coming in to care, he will be released back to the wild when old enough to fend for himself in about 8 months time..
Joey seen here 5 months after coming in to care, Marshall has thrived and will be released with his friends in a few months time. that perhaps he was the victim of a Motor Vehicle collision as he has punctured air sacs and some bruising and swelling (no break thank goodness). He came from an unusual location considering they are a rainforest species. Lamington National Park has them hopping around the campsites. So far the Pitta is showing great signs of improvement in intensive care and we hope that this multi colored rare beauty can be released soon. 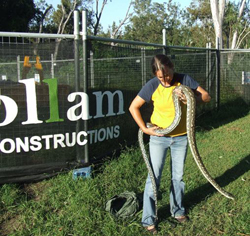 Tony, who works with Woollam Constructions called WIRES after a large carpet snake was found in the roof of Casino Public School toilet block. The old ceiling was being replaced, so the snake needed to be taken out of harms way until the job was finished. 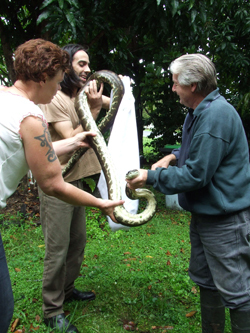 Melanie rescued the snake and it spent a number of weeks in care with Tony from WIRES until it was safe for it to be returned home. This little Mountain Brushtail possum was found at Lindendale 3rd April lying next to his dead mother. 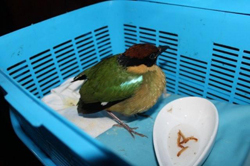 Thank you to Louise's two young sons for being vigilant, giving this little fellow a second chance at life. 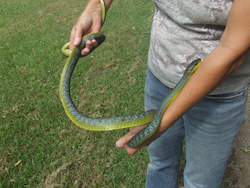 This non-venomous Green tree snake was rescued by WIRES snake handler Melanie from the Bentley Pre-school Hall. It had become entangled in some strapping that was tied around books. Luckily it wasn't injured and was released nearby into a large tree. Please be advised only trained reptile handlers should handle a snake, do not attempt a snake rescue unless you have been properly trained. This rather large Lace Monitor was found by WIRES Carers Eric Kinchin & Sharon McGrigor at Rummery Park, near Minyon Falls. He was unable to remove the plastic bag and required a little assistance. On closer inspection it was found that he was trying to reach some left over food located in the plastic bag. A few minutes after this photo was taken he actually started to eat the plastic bag and that's when Eric & Sharon decided to intervene. A little caution was needed, as he was already agitated. He was soon free to roam the camping grounds that are in his home range. A quick check of the area was also needed to remove rubbish from the area, so that this sort of incident would not happen again. 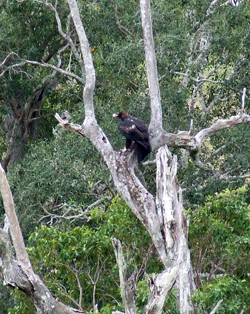 Large Lace Monitors are often seen in and around the northern rivers camping grounds. That is why it is so important that visitors take all rubbish home with them. This monitor was lucky. If he had ingested the plastic bag, he would have been in real trouble. 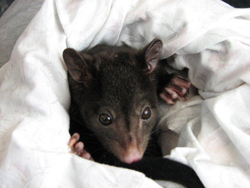 On the 5th March I was called to do a rescue in Wollongbar where I met up with Debbie who had called WIRES emergency phone line to say she had found a baby possum. When I got there I found a little 370 gram Mountain Brushtail possum sitting on the ground next to his decomposed mother, there was only fur and bone left. The little fellow was just sitting there looking at what was left of his mum, such a sad sight. Even though he was debilitated having had little nourishment he still put up a fight when I tried to catch him. He is doing really well in care and has been named little Renegade. His determination will serve him well in the future when he is released back to the wild when old enough to fend for himself. 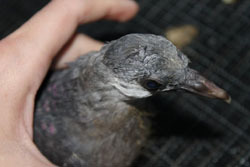 WIRES carer Tristan rescued this little White-headed pigeon after he was dropped from the sky by a crow. 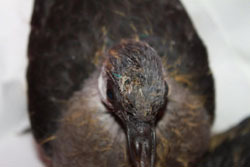 The pigeon's injuries included a split above the eye that required stitches, a split in the crop and its beak did not quite match up properly. As you can see in the picture on the right the stitches have now dissolved and the wound has healed perfectly. The crop gash which was 1.5 cm long healed from the inside. He isn't quite feeding himself yet but is in the aviary with two slightly older pigeons that have also been hand raised and he is starting to give it a go. Is Your Fencing Wildlife Friendly? Wildlife Friendly Fencing is a campaign encouraging landowners to make fencing safer and more effective for wildlife, people and livestock. Thousands of animals die each year on barbed wire. These entanglements often leave members of the public and rescuers distressed due to the severity of the injuries to wildlife. 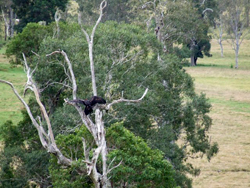 Nocturnal animals such as bats, gliders and owls are particularly susceptible, often entangled when flying down towards fruiting trees or dams and creeks. We ask people to modify the fencing adjacent to these ‘hot spots’ in order to minimise the risk to wildlife. Often this involves short sections of fence rather than its full length. Firstly, we ask landowners to consider whether the barbed wire fence is necessary. 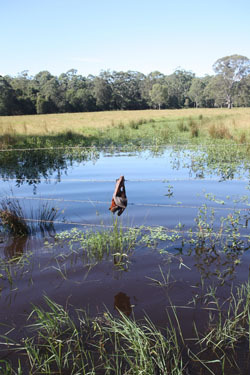 Sometimes the fence no longer contains livestock so could be removed or replaced with plain wire. If the barbed wire fence is needed, you could cover the top strand in the hot spot zone with poly pipe split longitudinally. WIRES volunteers can assist with this, with our poly pipe splitter and applicator. Other objects can be used to cover or make the top strand of barbed wire more visible. Consider replacing the top strand with plain wire, and when planning a new fence, consider whether barbed wire is really necessary. 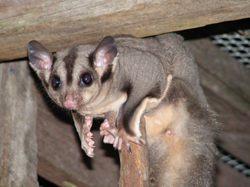 Our region is blessed with many possums and glider species, some endangered. They are common victims of barbed wire, so we ask landowners to plant trees to shorten the gliding distance between trees, no more than 20m apart. Wildlife corridors are critical for wildlife survival. Please don’t plant fruiting trees next to barbed wire fences. If you have old wire that no longer has a purpose, please dispose of it properly. 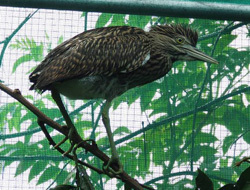 We regularly receive calls for wildlife entangled in disused wire or netting. It is very important that you do not cut the animal to try to free it as this would cause the animal further pain and almost certainly make it unviable for survival. WIRES volunteers are equipped and trained to remove animals from barbed wire, so call our hotline and someone will come to the animal’s rescue. Michelle Coker was bike riding in Wardell on the 4th of March when she came across what looked like a small rat on the road, when she picked it up she realised it was in fact a tiny Ringtail possum. She wrapped him snugly and put him in her hat on the back of her bike and rang me. Michelle named him Pablo and he came along for the rest of her 15km bike ride. Some hours later he arrived at my place lovely and warm though very thirsty. He has joined other Ringtail possums in my care of similar stage of development and all will be released together when old enough to fend for them selves. 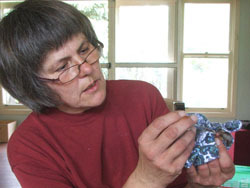 Recently, one of our WIRES members, Julie Reid, logged a Bush-hen into our database. Upon further investigation it was found that a small community of these threatened birds live around the Jiggi wetlands area. The Bush-hen is not to be confused with the more prolific swamp-hen. 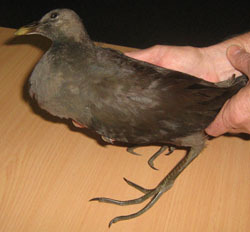 In NSW, the Bush-hen is listed as 'Vulnerable and Rare'. Only 58 known locations have been listed in NSW and documentation within Australia has been scarce and erratic. Little 'Boo' came into WIRES care from Melinda in Rosebank. She was found wandering around after heavy rain and had been washed from her burrow. She was flyblown, waterlogged and still dependant on her mothers milk. To make things worse some of her spines had become infected and were starting to fall out. 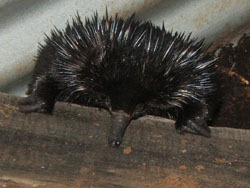 Not a good start for a 'just spined' young Echidna. After a thorough wash at Lismore Central Vet Clinic, Veterinarian Tony and her team of Vet Nurses set to work to clean between each of her infected spines. This was quite a lengthy process but everyone was delighted to help find and bathe her wounds. Little Boo was a very good patient and then went into care with WIRES Echidna coordinator, Sharon McGrigor, who had been assisting at the Vets'. Boo then began her rehabilitation in her new home, a hollow log in an undercover fly proof enclosure. She responded well to her new dry surroundings and enjoyed her specialized milk & meat formula. 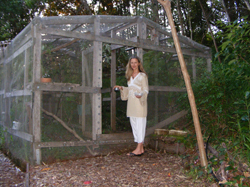 Under Sharon's care, her wounds began healing and she steadily gained weight. Sharon said, “these little ones often get very bored in care, so it is important to keep up a regular supply of new termite ridden, rotten logs for them to explore. 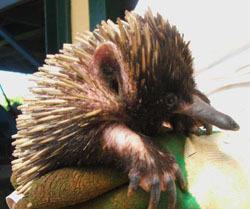 Boo is no different to any other young Echidna, and delights at destroying all of her logs in search of termites”. She often plays Peek-a-Boo, to keep herself amused, and thus her name, Boo. A month later Boo has now gained her release weight and is ready for release back into her 'home range' on Ridgewood Road. Sharon believes she has a will to thrive and says that Boo is very active juvenile. 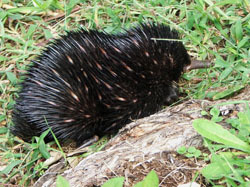 All good signs for a young dispersing Echidna. She has a bright, inquisitive demeanor and should do well in the wild. Boo is almost ready for her release and is just waiting for the rain to stop. To keep her occupied, while she is waiting, we have added some more logs & leaf litter to her enclosure for her to explore. In between the showers, when the sun does comes out Boo has some time to explore out of her enclosure. She is just so cute-I have completely fallen in love with her. But I look forward to her release day so that she can explore the big wild world. I called to Anne's place at Coffee Camp with the intention of collecting a Fig bird chick that had been found sitting on the bottom wire of a fence - mum nowhere in sight. When I arrived on Sat morning Anne told me that she had seen the mother flying around at about 11 pm. At that stage the chick was in a box on the outdoor table. It was able to perch but not fly. I came home and collected a hanging basket, filled it with leaves and attached it to a tree branch at the back verandah. Whilst there I gave it a small amount of fruit and asked Anne if she could support feed it and observe the mother and chick. I could see Mum flying about so felt confident she would continue to feed it. Apparently Mum came back about every 15 min's to feed it!!! I called in today to collect my hanging basket and Anne said Mum and young one flew off together about a week ago. Thank you Anne for helping reunite Mum and chick. 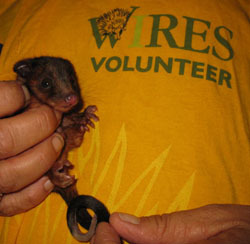 WIRES rescuers Jackie and Ken collected a very small Ringtail possum called in to our emergency roster on 14 February and brought it straight to me as it had been brought in to the caller by their cat. In cases such as this it is vital that the animal is given antibiotics as soon as possible to stop infection. I opened the pouch expecting to see a small Ringtail possum, but was most surprised to see a juvenile Sugar glider the colour of a Ringtail. 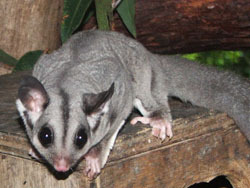 Sugar gliders are grey with a black stripe running from nose down their back. This one had the right markings but the wrong colour. I kept the little female in care for 6 days to ensure she had no ill effects from being caught by the cat, and as her course of antibiotics were finished I called Jackie and Ken to release her where she had come from so she could join her mum and colony. I called the person that had found the little Glider as we needed to return her to the right location as Gliders are territorial. This one also would need to find her mum. Although she was at dispersal stage of development, she would still need the colony for survival. 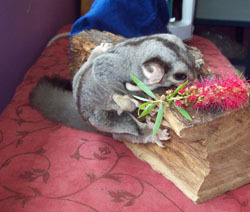 The caller informed me that the cat had smelled strongly of eucalypt when it had returned home with the little Glider, and the only eucalypts were close to his house. 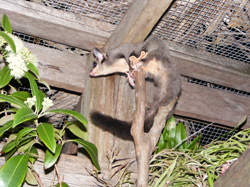 Gliders are released well after dark as predators are many, so this little lady was taken to the site at 9pm. Jackie and Ken opened the carrier cage by the eucalypt trees and the little Glider jumped out, did a hop on the ground and leapt up the tree. It continued right to the top and disappeared from sight. Jackie said she had never seen anything move so fast. The glider had recognised the smell of home. 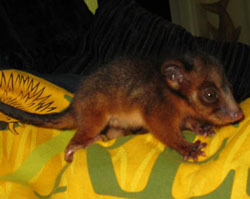 Sugar Gliders can have a brown tinge when very old, but in approximately 13 years of caring I have never seen a healthy young brown Sugar Glider. Just goes to show there are still surprises out there in the wild. 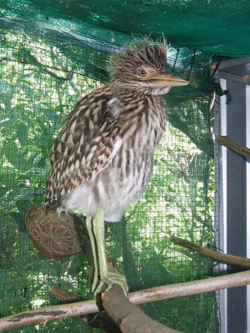 Cathy noticed this Nankeen Night Heron chick on its own in a park in Casino while she was walking her dog. She called WIRES when she arrived home, but in the meantime the chick had wandered off. With Cathy's help the chick was located after some searching, it was very dehydrated and starving. Heron adults will not feed their chicks if they fall from the nest, unlike a lot of other birds. 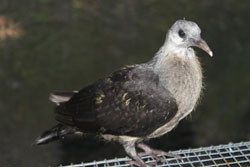 Thank you to Cathy for finding this unusual chick, without help it would have surely died. 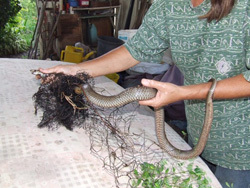 When Mary realised her orchard netting had become a deadly trap for a snake she called WIRES for assistance. WIRES reptile handlers Helen and Melanie went to Dyrabba to Mary's property and found this Eastern Brown snake in big trouble as you can see, totally entangled in the netting. Helen and Melanie managed to free the snake which was very dehydrated and it will be in care until it has recovered form its ordeal. Thank you Mary for calling WIRES. 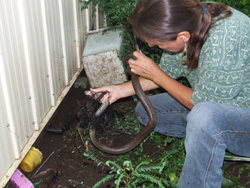 Please be advised only trained reptile handlers should handle a snake, do not attempt a snake rescue such a this unless you have been properly trained. 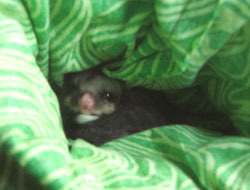 June from Eureka found this tiny Mountain Brushtail possum lying under a tree on her property. June called WIRES and the little female was brought in to care. She was very dehydrated and undernourished indicating that mum may have been ill for some time before the joey was found. Mum was not located unfortunately. 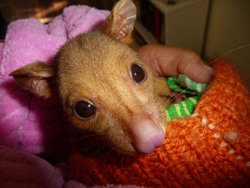 Possum was given intensive care, it is early days yet and we will keep up informed as to her condition. 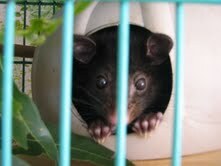 Unfortunately the little possum joey did not survive, she died after 4 days in care. 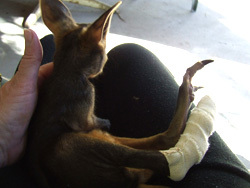 This little Red-Necked wallaby came into care in September 2009 a victim of the Repco car rally. Her mum was killed by a spectators car near Kyogle. 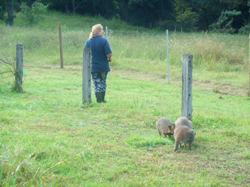 She spent her first 4 months in care in a nursery pen with another 4 Red-Necked wallabies of similar stages of development, cared for by WIRES macropod carer Tina. 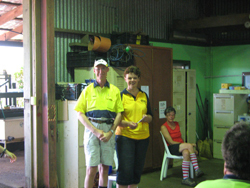 Northern Rivers members of the public. 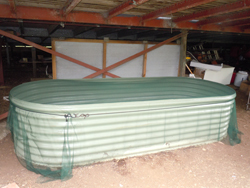 Large enclosures such as this are needed to prepare hand reared macropod's for release back to the wild. 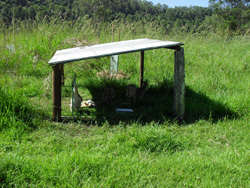 Image on the left shows small shelter within the enclosure where supplementary food and water is available. The little joey will be released in approximately 4 months time. 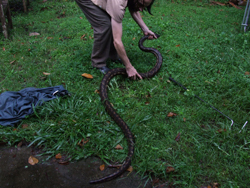 Alan was slashing a section of property that is seldom slashed when he realised he had run over a large Carpet python coiled around her eggs. 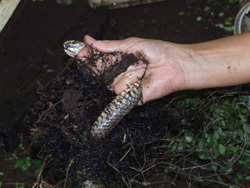 Mum python was dead and many of the eggs had been exposed and the tiny hatchlings had also died. However a number of eggs were still intact, so Alan called WIRES asking would the eggs possibly hatch. WIRES reptile coordinator Michael collected the eggs and after 7 days the eggs started to hatch. 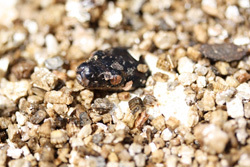 Some of the little hatchlings can be seen in these images, 11 were returned to Alan's property. 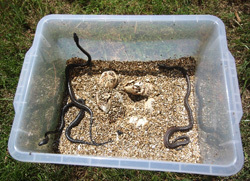 Thank you Alan for calling WIRES and giving these tiny snakes a second chance at life. 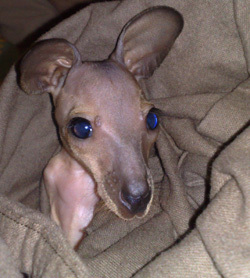 Last August late at night when Annette was on her way home, she came across a dead wallaby on the road, she stopped and found this tiny joey in her mums pouch. Mum had been dead for some time and her joey was dehydrating and suffering from hypothermia. WIRES macropod carers Sherryn & Dave spent the next weeks fighting to keep the joey alive giving intensive care day and night. 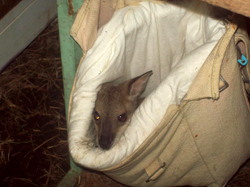 The joey finally responded, seen in image to the left 3 weeks after coming in to care. Joey is now 10 months old, she is a Red-Necked wallaby and doing extremely well she will be released back to the wild in about 4 months time with other wallabies she has grown up with whilst in care. Thank you Annette for stopping and calling WIRES. 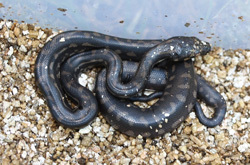 This Bandy Bandy snake was found trapped in a swimming pool skimmer box. It was still very much alive and after a few days in WIRES care, ensuring it had no injury from it's ordeal was released back to the wild. The flying fox was lactating and as there seemed to be no injuries to the animal Lib was wanting to release it back where it was found so it could hopefully be reunited with its pup. She collected me on the way through to Blue Knob the following day, witnessed both by the rescuer and myself the Flying Fox was released. My first release!! Must say I am now hooked on flying foxes. 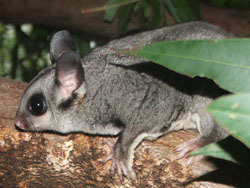 This adult Squirrel glider was found by Mick on his property at Cawongla caught on barbed wire. Mick carefully untangled the glider and called WIRES. The glider was treated for a deep wound on his lower abdomen at Lismore Central veterinary clinic, then collected by WIRES carer Tina. He was given daily antibiotic injection for some time, and after three weeks in care he is finally ready for release back on Mick's property where his colony is located. Thank you Mick for calling WIRES. 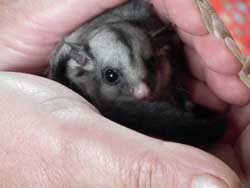 This little Squirrel Glider was handed in to WIRES by Andrea & her family at Brunswick Heads. She weighed only 80g and was found orphaned and alone. They fell in love with her and named her Pretty Girl. Pretty Girl was underweight and needed to be fed on a specialized diet which was supplemented with bugs. Pretty Girl also needed to build up her muscle tone so that she could learn how to glide. Pretty Girl is now doing very well and is enjoying discovering the tastes of various barks, saps and foliage. 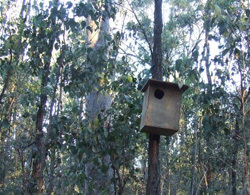 She will be released into the wild, in her new nest box home with her new family once she has achieved release weight. 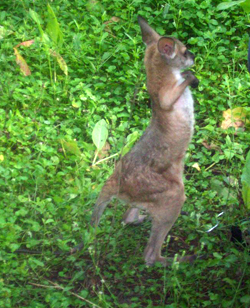 This tiny Swamp wallaby was found by Pam at Richmond Hill on 10th December 2009. There was no sign of the joey’s mother. 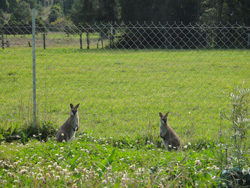 WIRES receives many calls for Macropod's (wallabies, kangaroos and pademelon's). Most of these calls relate to car accidents or dog attacks but in some cases, as with this little fellow, the reason for the joey being orphaned is unknown. On arrival he was very undernourished and extremely dehydrated. He was given intensive care before he regained strength and interest in life, and he was named Phoenix. He is approximately five and a half months old. At this stage of development he would still be in mum’s pouch, peering out as she forages for food. 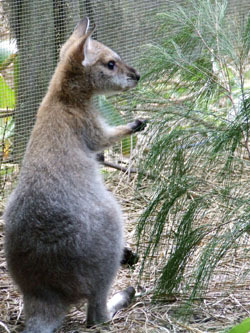 As he is now fully recovered from dehydration, shock and malnourishment he spends his days in the macropod enclosure still in his pouch, not yet old enough to venture out, but it will not be long before he will as interact with the other wallabies in care and learn vital survival skills only other Macropod's can teach him. Raising wildlife is a responsibility all WIRES carers take very seriously. Intensive training is undertaken in order to ensure all animals are given correct treatment whilst in care, ensuring the animal has the best chance of survival after release. Raising wildlife is not like raising a kitten or a puppy that will be looked after for the rest of its life. When wildlife is released back to the wild, they have to have all the skills necessary for survival such as knowing what to eat, where to find it, and recognising predators, which includes domestic dogs and cats. They must also be able to cope with changing weather conditions, including knowing how to find shelter and water. This little orphan has a long road ahead before his release back to the wild in nine months. He will spend this time in a large enclosure interacting with other macropod's in various stages of development. 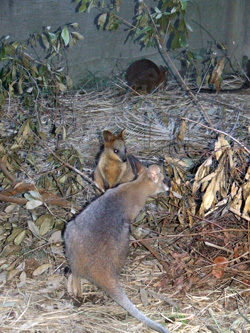 Here they learn macropod behavior from each other and skills vital for their long term survival.. Image on left 2 months after coming in to care. This little bandicoot was found by Sky on the way back from the Channon Markets late on Sunday night. .
Something caught his eye as he was driving along after a long day at the market so he stopped and found the dead mother. He then noticed a little deceased sibling so he kept looking around and found this little guy, still alive. He knew one of our carers Julia was just around the corner so he whisked it over to her post haste. He weighed only 30g and had no fur whatsoever so it took around the clock intensive feeding to keep this lucky little bandi alive. 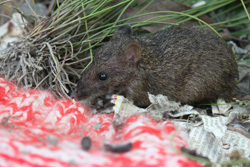 Fortunately this little bandicoot is doing very well and will be released very soon.